Jane and I went to our old favorite spot off I-10, Chuckwalla Bench, on BLM land south of Joshua Tree in the Colorado Desert. We were joined by Dave Hasenauer and his dob. Bad news about Red Cloud Rd., the dirt road we take to our favorite spot. The road is sadly in need of some maintenance. Portions of the road are very treacherous with deep ruts and deep sand. We didn’t encounter any problems this trip, but it will be a worry. We had crystal clear skies all night, with temperatures around 85°F at sunset, dipping close to 50°F in the wee hours. The evening twilight featured Venus in its new evening apparition setting in the west, Mercury just below, with Jupiter one day after opposition rising in the east. Early in the evening while spotting satellites, we managed to catch a bright fireball meteor (7:22 p.m.) probably around magnitude -10. I saw a double terminal burst from the fireball, which traced from Cassiopeia through Triangulum. 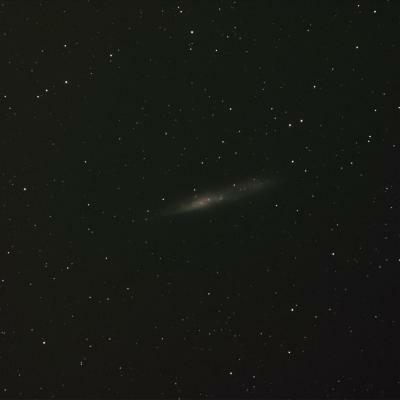 It left a persistent train that was visible for several minutes in binoculars and Dave’s telescope. Jane even indulged in a little afocal astrophotography capturing some splendid crescent moon shots on her point-and-shoot camera. 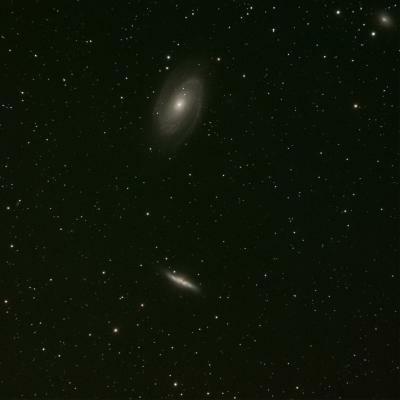 I had a couple of “firsts” in my astrophotography accomplishments, doing my first successful drift alignment when my polar alignment was slightly off, and finally successfully capturing useful “flats” for image calibration in the morning twilight. I also had a brainstorm about how to process the color data from bright targets without data being clipped in the bright areas. 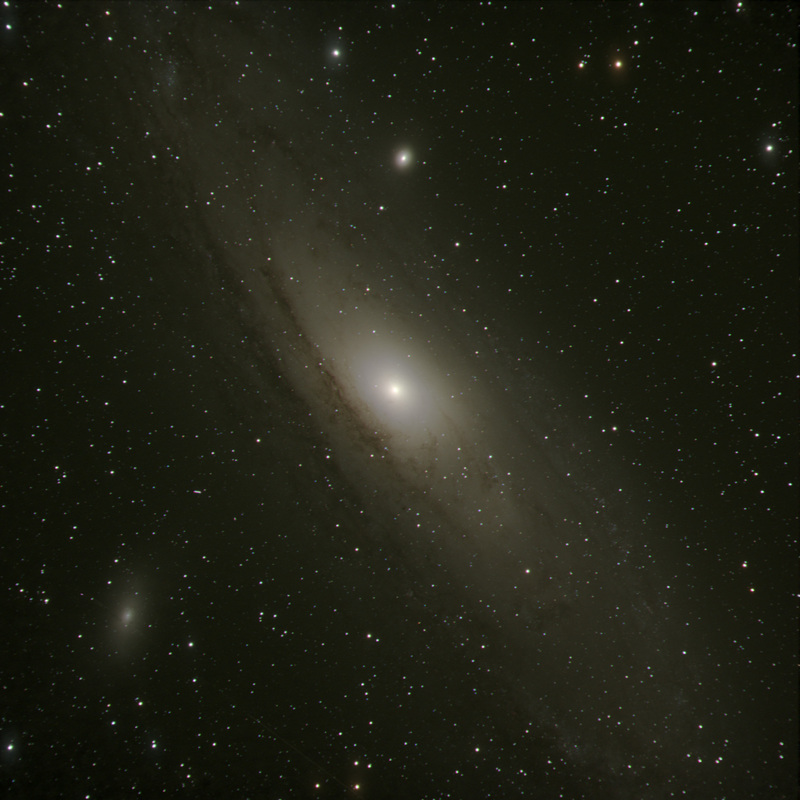 With that in mind, first let me revisit my M31-M32-M110 the Great Galaxy in Andromeda from last week, this time in full color. 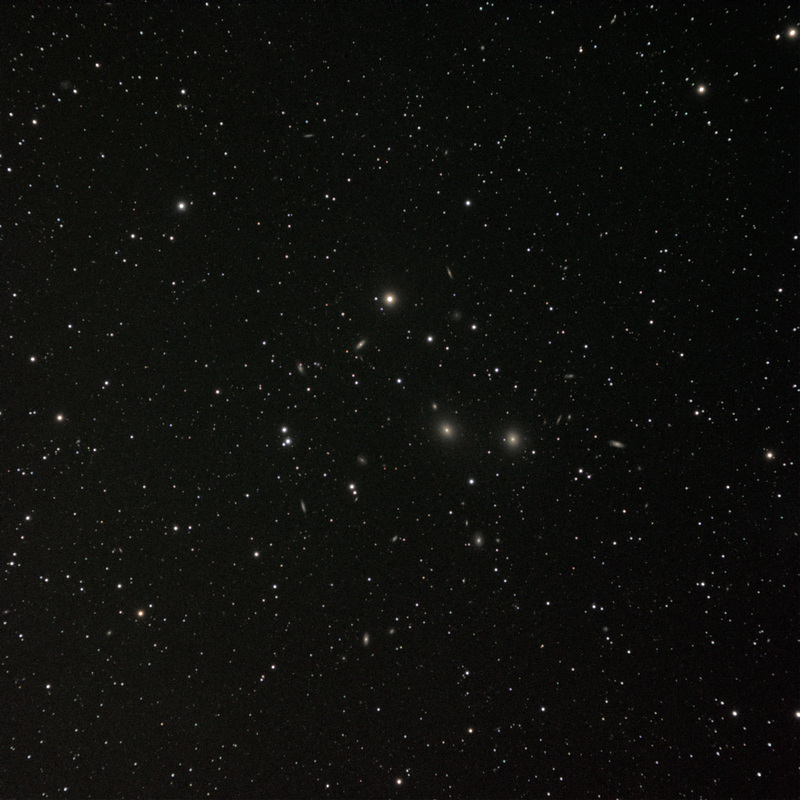 And I promised to revisit the Pegasus 1 galaxy cluster, this time giving it an hour of exposure, which it fully deserved. Here’s the full field first. 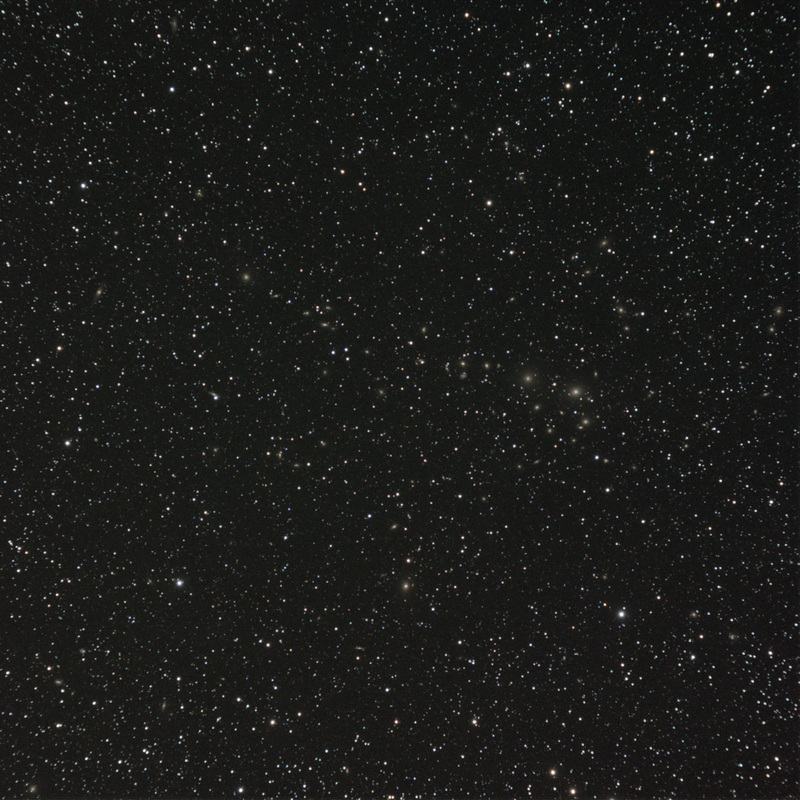 Pegasus 1 Galaxy Cluster, click for full-resolution. Jane was observing this delightful face-on S-shaped spiral galaxy, NGC7479. It was such a small target that I didn’t think my short-focus 4-inch would do it much justice. It turned out to be a delightful crop with lots of detail. 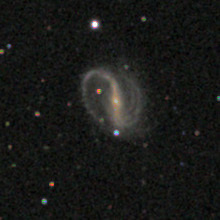 Another surprisingly good image came from NGC55, a fabulous extended galaxy, so far south in the sky that it’s rare to be seen by northern-hemisphere astronomers. Complicating matters is a light dome from Inland Empire cities that encroaches on our southern horizon. Nevertheless, my 15-minute exposure was worth passing on. The full-resolution shot is very nice with lots of detail. 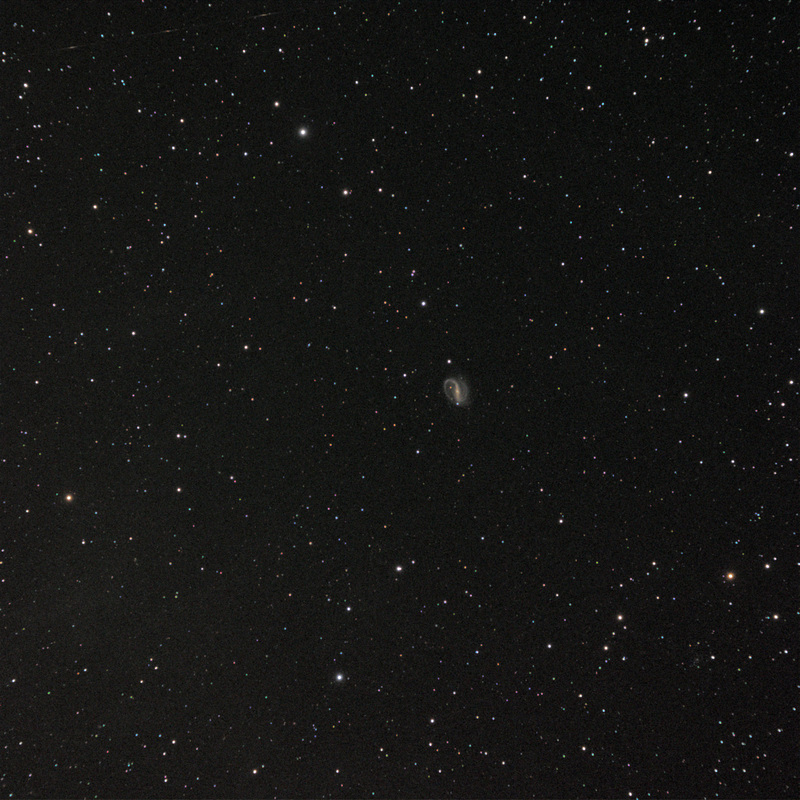 NGC55, one 15-minute exposure, through a bit of "foreground" light pollution. 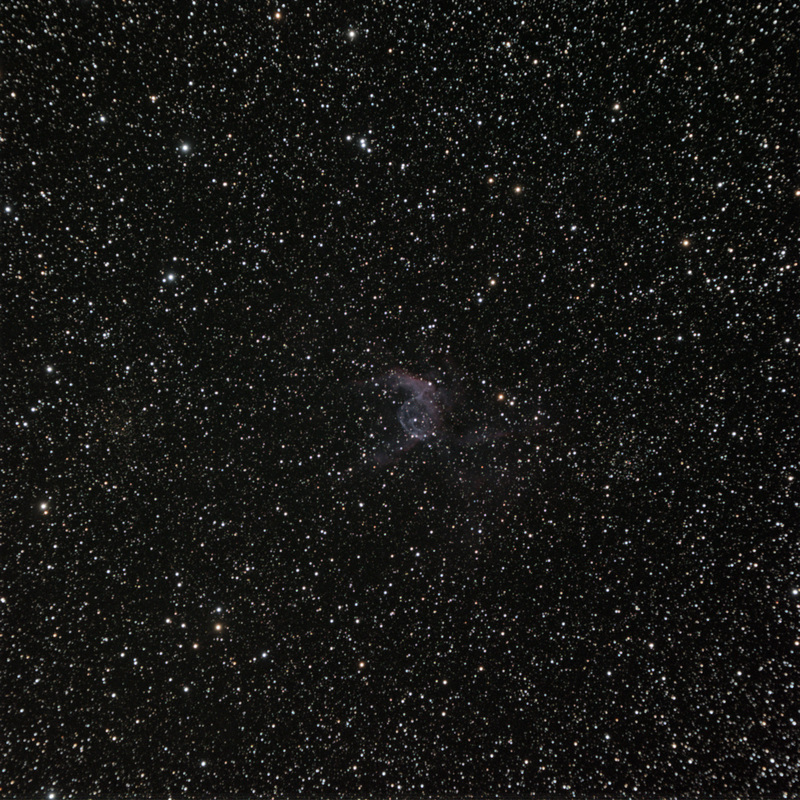 Jane also suggested one of her favorite difficult winter visual targets, NGC2359, known as “Thor’s Helmet.” I collected an hour’s worth of photons. Here’s the detail from the center of the field, click for the whole thing. 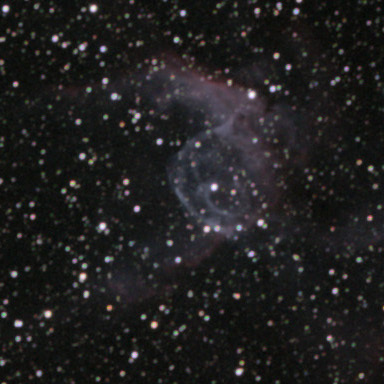 NGC2359 "Thor's Helmet," 4x15 minute exposures, detail from the center of the field. I’ve long been fascinated with distant galaxy clusters, and they’re very difficult visual targets. Some find them to be uninteresting photography targets. 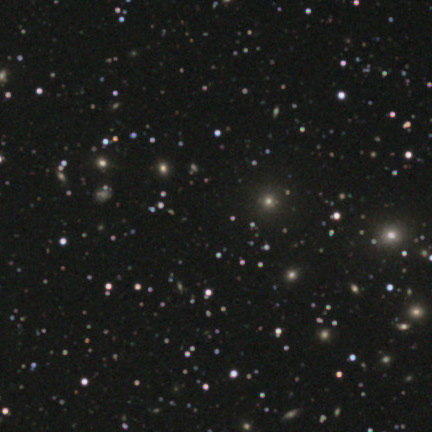 I opted to try 30 minutes on Abell 426, a massive distant galaxy cluster in Perseus. Here is some detail from the center, but the full field is full of easter eggs. 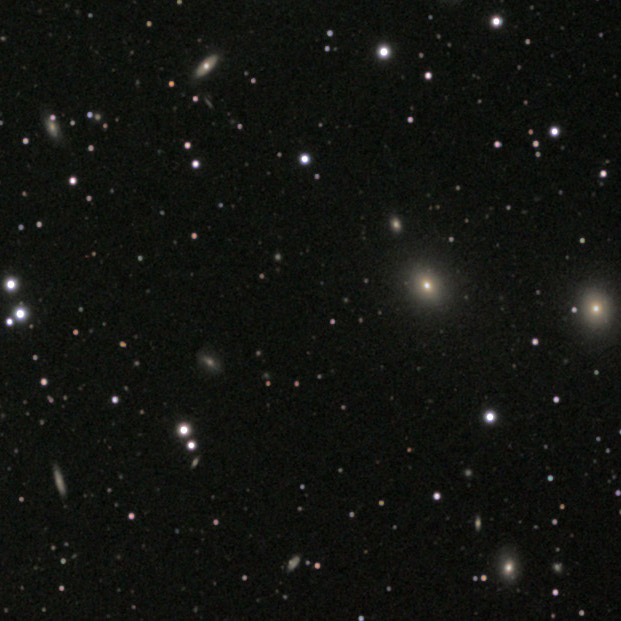 Detail from the Abell 426 Galaxy Cluster in Perseus. Click for the full field. My last target of the evening was to be an indulgent treat, the M81-M82 galaxy pair in Ursa Major. My mount battery finally quit just at the end of the second exposure, and morning twilight was about to arrive. A fabulous end to the evening. Nice double loop detail in Thor’s Helmet! Wow! Great pics! In the full-sized view of M32, it looks like you caught a shooting star crossing through M110. Looks like you had some spectacular vistas of the skies. 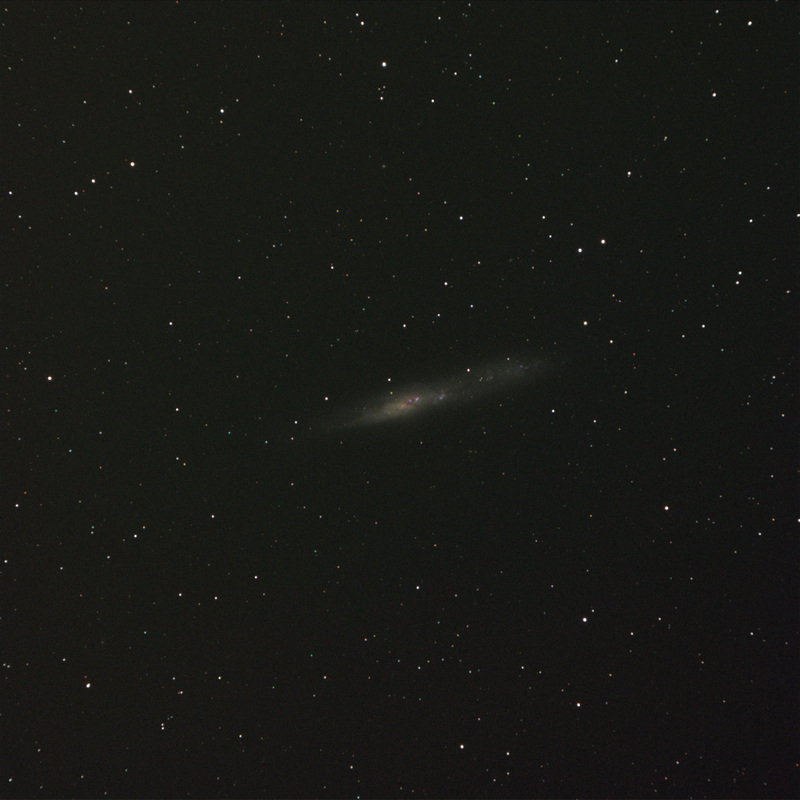 Heh, yes I had a satellite pass through M110 on one of the exposures. 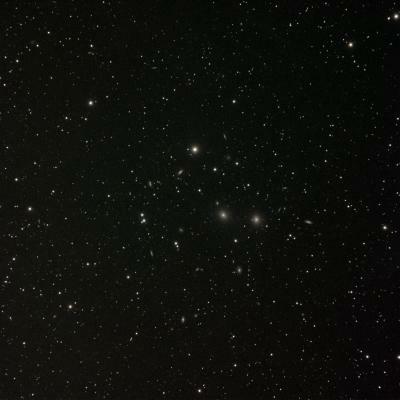 Look at the M42 from the previous week, there are about six passing through the Trapezium area. That’s right near the celestial equator — they were probably all geostationary sats that my mount tracked across.